An emergency communication plan so I can quickly get my family together. Practiced a step-by-step bugging out plan with my family. But let’s take things a step further. Once you’ve chosen your Bug Out Vehicle, it is time to get it ready for bugging out. Why Prepare Your Bug Out Vehicle? Honestly, prepping your vehicle for bugging out doesn’t take much time. 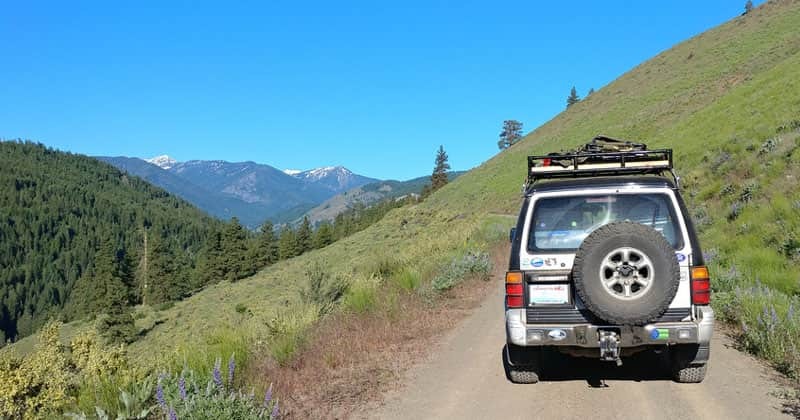 Many of the items on this Bug Out Vehicle Checklist should be in your vehicle anyway. 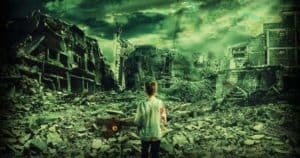 Doomsday may never happen, but breakdowns inevitably will! But in the event that something terrible does occur, you want to make sure your vehicle is ready to go. As numerous disasters have taught us, the key to survival is fleeing early. Each minute you save beating the crowds, road blocks, and looters drastically increases your chances of actually getting out unscathed. Here’s some more tips on bugging out by vehicle. 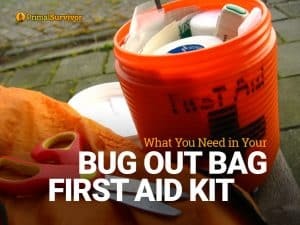 It is highly recommended that you keep one Bug Out Bag at home and keep another in your vehicle. The reasoning for this is that disaster could strike while you aren’t at home. A lot of people also keep BOBs at work too. The whole benefit of bugging out by vehicle is that you get to carry tons more gear with you. Why the heck would you limit yourself to what’s in your BOB when you can load more? 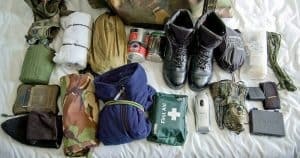 So pack as much survival gear in your vehicle as is reasonable! 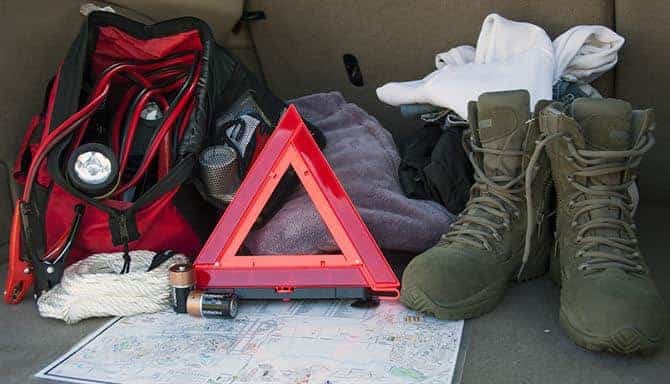 Consider your Bug Out Bag items completely separate from your Bug Out Vehicle items. The only time you should use your BOB items is if you abandon your vehicle and have to set off on foot. A major terrorist attack has just occurred and you flee by car. Your BOB is on the seat next to you. You’ve got 50 gallons of water in the car, but it is all the way in the trunk and in large jugs. So, you decide to drink the bottled water from your BOB. “I’ll refill them later,” you tell yourself. You grab your BOB, abandon the vehicle, and set off on foot through your Route B. 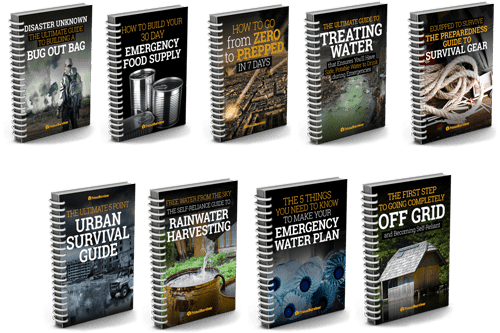 The problem is that your Bug Out Bag is now lacking water. If only you’d drunk the water in your trunk instead of depleting your limited BOB supplies! Because you are treating your BOB items as separate from your vehicle items, you will end up with some duplicates. For example, I’ve got a survival knife in my glove box and one in my Bug Out Bag. I’ve also got duplicates of survival food and water – there’s just tons more of it in my trunk than in my BOB. I get that not everyone will be able to afford duplicates to keep in their BOV and BOB. 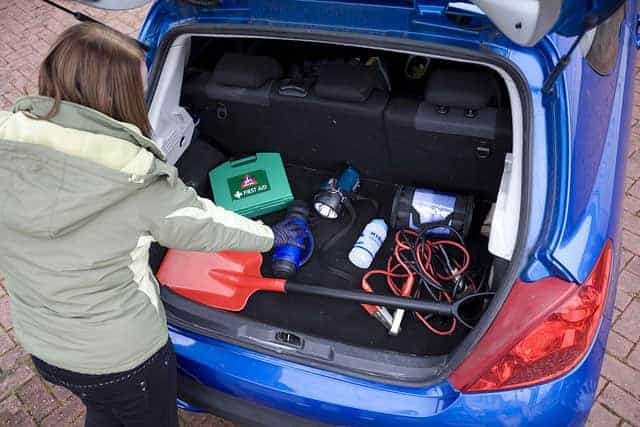 Since you should keep a BOB at home and in your car, and you need additional items for your vehicle, you can end up with triple of some items. When budget is an issue, then you can remove items from your BOB to use – just put them back right away. Or, better yet, focus on everyday carry survival items so you always have survival gear on you. 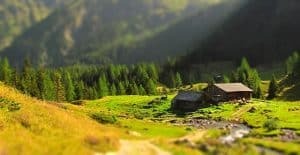 This Bug Out Vehicle checklist is made for people who plan on fleeing in a car, truck, SUV, or other “traditional” vehicle. At the end, you’ll see some items for alternative Bug Out Vehicles too. 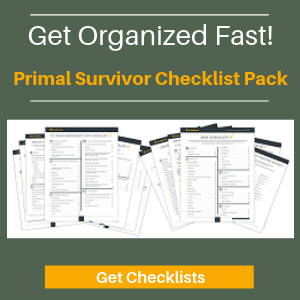 You might not need everything on the checklist but do start thinking about Worst Case Scenarios, such as if your BOV got a flat tire or you ran out of gas. These types of thought processes are what help us get prepared! *If you are going to transport extra fuel, the safest way is on your roof rack or a rack on the back of your vehicle. Never leave extra fuel inside your vehicle. Bottled water – the more the better! Yes, there is more! You will need to make sure your Bug Out Vehicle is always ready to go. Rotate the water too. Water bottles leak after about 6-12 months, especially when in a hot car trunk. Is there anything I missed on the BOV checklist? Let me know! 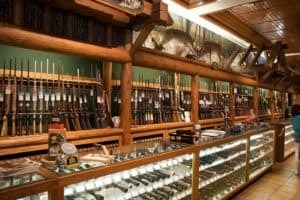 A good list of all the stuff you “should” have. “BUT”—-how about a minimum list of what is absolutely necessary. Have you calculated the weight/volume of you ideal list? Would definitely not fit in a Rav4 SUV ( and have room for passengers) —-unless you pull a cargo trailer! As always you must prepare for your own individual situation. This is a general list – not everything is required – decide what you need for your own needs and priorities and go from there. I have a for wheel drive pickup and a all wheel drive toyota highlander and a 7 X 14 motorcycle trailer. Which vehicle would be best and should I pull the trailer to put supplies in, and should I bring the motorcycle (Harley-Davidson Ultra Classic limited) or leave it behind. Hi Gary – totally depends on the situation. If you have the time and can plan ahead\travel back roads etc then bring as much as you can. If you need to get out of dodge quick then the Harley and a BOB might be your best option. Think about the most likely scenarios in your area and plan the best response. I have an extra BOB in the car, and a Get Home Bag with water and extra food, just in case. The GHB sits right where I can grab it if need be. The BOB is in the trunk along with a emergency tent. Many items are duplicate but it will be worth it. Additionally I have an extra US Army sustainment bag with food and condiments to supliment my two bags. Overall I have about five days worth of food and water for two. Instead of filled water bottles in the back I have 1 liter pre packed and sealed packages of water with a five year shelf life. No leakage with these so far. Overall my car preps are still a work in progress. I do worry about being able to get into or have access to the trunk under certain conditions. I might move the extra BOB to the back seat for better access since the front passenger seat might be occupied if we can’t take my wife’s car also. Excellent kit there Broadwing. Only issue I see with BOB on back seat is the risk of getting it stolen if it is visible from the outside. It may be worth hiding the essential stuff in the glove compartment – we have a post on that here.